This article is about the TV series. For the Argentine film, see Empty Nest (film). For the psychological phenomenon, see Empty nest syndrome. Empty Nest is an American sitcom that originally aired on NBC from October 8, 1988, to April 29, 1995. The series, which was created as a spin-off of The Golden Girls by creator and producer Susan Harris, starred Richard Mulligan as recently widowed pediatrician Dr. Harry Weston, whose two adult daughters return home to live with him. For its first three seasons, Empty Nest was one of the year's top 10 most-watched programs. It was produced by Witt/Thomas/Harris Productions in association with Touchstone Television. 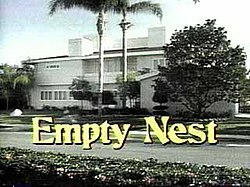 Empty Nest was part of NBC's Saturday night block of programming, and during its first four seasons it aired at 9:30pm ET, directly following The Golden Girls. An early version of the series initially appeared in the 1987 Golden Girls episode "Empty Nests" and was intended to act as a backdoor pilot for the spin-off, which was to begin during the fall 1987 TV season. In the episode, George and Renee Corliss (played by Paul Dooley and Rita Moreno), were introduced as the Girls' neighbors, a middle-aged couple suffering from empty nest syndrome. Their teenage daughter Jenny (Jane Harnick), who had left for college, and Renee's brother Chuck (Geoffrey Lewis), also appeared. The Corlisses also had an annoying neighbor played by David Leisure (although in this version his character was named Oliver). Ultimately, the series did not go ahead as planned and the premise was later extensively revamped with a new cast before Empty Nest debuted in 1988. The set of the Corlisses' house, however, was exactly the same as the one that later became the Weston residence. Eldest daughter Carol (Dinah Manoff) was a neurotic, high-strung recent divorcée, while middle daughter Barbara (Kristy McNichol) was a tough undercover police officer. The two sisters frequently bickered and vied for the attention of their father, whom they called "Daddy." (Harry occasionally expressed regret at never having had a son.) The Westons' large dog Dreyfuss was also prominently featured. In 1992, McNichol left the show and the youngest Weston daughter, Emily (Lisa Rieffel), joined the cast. Her character had not been seen before, but had been mentioned as being away at college. Rieffel left after one season, and for the show's final two seasons only Carol remained of the Weston children. McNichol returned for the series finale in 1995. Another main character was the Westons' neighbor, Charley Dietz (David Leisure), a womanizing cruise ship employee who frequently barged into the house unannounced to borrow food or make sexist comments. Charley had a father-son relationship with Harry and a love-hate relationship with Carol. Harry's job was another major focus for the show. For the first five seasons he worked at a hospital, where he was assisted by wisecracking Southern nurse Laverne (Park Overall). In season six Harry retired, eventually going to work for a struggling inner-city medical clinic run by the tough-talking Dr. Maxine Douglas (Marsha Warfield). Laverne, having been fired by Dr. Weston's replacement, came to work there as well. Other characters who later joined the cast were Carol's boyfriend, Patrick (Paul Provenza), an artist who was almost as eccentric as she. Patrick convinced the Westons to let him use their empty garage as his new painting studio and, when his relationship with Carol became serious, he eventually moved in altogether. Their romantic bliss was short-lived, as they broke up at the beginning of season six. However, this was not before Carol became pregnant with Patrick's child; their son, Scotty, was born in November 1993, and Carol chose to raise the baby on her own. Estelle Getty reprised her Golden Girls character Sophia Petrillo during Empty Nest's final two seasons (after the cancellation of The Golden Palace). It was explained that Sophia had moved back into the nearby Shady Pines retirement home. Lisa Rieffel (Emily) and Paul Provenza (Patrick), who appeared in Season Five (1992–93) do not appear in either cast photo. In 1991, Empty Nest spawned its own spinoff, Nurses, a sitcom about a group of nurses working in the same hospital as Dr. Weston. The three series (Empty Nest, The Golden Girls and Nurses) represented one of the few times in American television history that three shows from the same producer, all taking place in the same city and explicitly set up with the characters knowing each other from the very beginning, aired on the same network in one night. On at least two occasions, Harris wrote storylines which carried through all three series as fictional crossovers. Mulligan and Manoff had previously appeared as father-in-law and daughter-in-law respectively, in the show Soap, created by the same production team as Empty Nest. The show's theme song was "Life Goes On", written by John Bettis and George Tipton and performed by Billy Vera. For the first three seasons, the song was presented in a slower, more melancholy yet comical arrangement. The original opening titles sequence showed Harry Weston taking Dreyfuss for a walk around town, with still images of the other regular cast members shown as they were credited. When the third season began, a new opening sequence debuted, made up of footage from the series' episodes showing each of the regular cast members. For the final four seasons the theme song was presented in a higher, more upbeat arrangement with female backup singers; the titles sequence style introduced in the third season remained. The following is a list of Empty Nest episodes featuring characters from The Golden Girls or Nurses. The series ran in syndication from September 1993 to September 2000, shortly before the death of star Richard Mulligan. During this time, Empty Nest aired on TBS from September 16 to December 6, 1996, and on WGN from September 16, 1996 to March 26, 1999, with both stations airing the series as part of the regular syndication run (both TBS and WGN were superstations). In the subsequent decade, the series did not air on American television. Hallmark Channel, which also owns the rights to The Golden Girls, picked up the rights to the show in early 2011 and aired it from February 26 to June 26 of that year, but eventually removed it altogether. Upon its launch on April 15, 2015, the new digital sub channel Laff began airing the series, until May 2018. In Canada, the series was rerun by CBC during the 1990s. In 1989, Richard Mulligan won both the Emmy Award and the Golden Globe Award for Best Lead Actor in a Comedy Series. The series received a number of other Emmy and Golden Globe Award nominations over the years, especially for Mulligan and for Park Overall, who was nominated three times for a Golden Globe Award. ^ "Golden Girls' Creator Adds Shows". LA Times. September 10, 1991. Retrieved 2010-08-24. ^ "BBC – Comedy Guide – Empty Nest". Web.archive.org. Archived from the original on December 5, 2004. Retrieved 2016-02-24. ^ a b Rosenberg, Howard (October 8, 1988). "'Empty Nest' Looks Like Good Place to Nestle Down". LA Times. Retrieved 2010-08-23. ^ Haithman, Diane (November 24, 1990). "'Empty Nest': TV's Unknown Hit". LA Times. Retrieved 2010-08-23. ^ Brooks, Tim; Marsh, Earle (2007). The Complete Directory to Prime Time Network and Cable TV Shows 1946-Present (Ninth Edition). Ballantine Books. p. 1692-1693. ISBN 978-0-345-49773-4. ^ TBS Log – Sitcoms Online Message Boards. ^ TV Guide – September 14–20, 1996. ^ TV Guide – March 20–26, 1999.